Sky Rock, in Dorsey's Knob Park, stands nearly 600 feet above a landscape of deep valleys and tall pines, providing a picturesque view of greater Morgantown and the surrounding area. 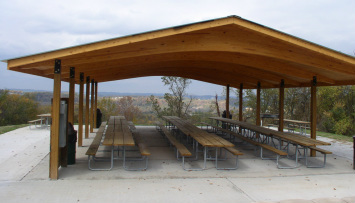 The 70 acre park, located adjacent to U.S. 119, is right outside of downtown Morgantown, but miles away from the hustle and bustle of the small city surrounding it. It is because of this comforting, country feel that many are drawn to the park and to Dorsey's Knob Lodge. With trails throughout, a disc golf course and interactive playground, Dorsey's Knob Park is worth a visit or a more regular get-away.